Schmuhl School is one of the early country schools located in New Lenox Township. Approximately 140 country schools dotted the landscape of Will County during the late 1940's. In those days, schools would be two miles apart and children from surrounding farms would walk to school, often cutting across farm fields and over fences to get there. Today only a very few of those schools remain. The original Schmuhl School was a wooden building on the farm of Henry Schmuhl. It was a one-room school as was typical at that time. Around 1932 the wooden school burned, the direct cause was never known. 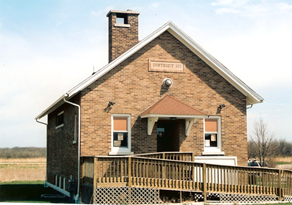 The brick school we see now was erected in 1932 and classes were started in 1933. This new school was modern for its time having a furnace in the basement, electricity, water and indoor chemical toilets. It also was a one-room school and had all eight grades in the one classroom. The typical school enrollment was 12 students. In those days the teacher's salary was $80.00 per month with $5.00 going toward the teacher's pension. In addition to teaching all the students, the teacher cleaned the building and was responsible for starting a fire in the furnace and keeping it going all winter long. In 1949 or 1950, after World War II, the school was divided into two classes, with lower grades upstairs and the other in the basement. The school had no library but a book lady stopped by with books for the children to read. A milkman came with milk in half-pint glass jars each day and children brought their lunch to school in pails. Occasionally, a music teacher would visit the children. Due to school district consolidation in the 1950's, Schmuhl joined School District 122. When the school district sold the property for development, the New Lenox Area Historical Society acquired the building. The school was moved in April 2000 to it's present site on the Hickory Creek Barrens property across from its original location on the south east side of Rt. 30 and Schoolhouse Road. Schmuhl School is an officially designated landmark of Will County. It is a New Lenox treasure! After careful and ongoing restoration work, Schmuhl School once again enjoys the happy voices of children as they come to "SPEND A DAY IN A ONE-ROOM SCHOOLHOUSE".